I used to love blue cheese before I went vegan, so I really wanted to make a vegan version which has the same creamy texture and deeply savory, tangy flavor. I tried a lot of recipes, including a few with fermented tofu from the Chinese grocery which I could not bring myself to eat. Eventually the fermented tofu got thrown out and that was the end of my experiments for a while. The blue cheese itch was still there though, so eventually I tried again, this time without any exotic ingredients. Beyond all expectations, it was a succes! It doesn't taste exactly like a real moldy blue, but it does a good job at filling that tangy, creamy, savory hole in my life. Even the color is a little blue-greenish, thanks to the pumpkin seeds. You sprinkle in some spirulina powder to make the color even more life-like. This is quite a simple recipe. You just need a foodprocessor or strong blender to puree the pumpkin seeds. Mix all the ingredients, pour the mixture into a container and put it into the fridge to firm up. Super easy! This is actually a double recipe. You can make the cheese as a lower-calorie spread, or you can add coconut oil to make it into a firm slice-able block. Both versions are can be spread on crackers and used in salads, casseroles and on pizza. Put the pumpkin seeds in the jar of your foodprocessor or blender together with all the other ingredients except for the tofu and coconut oil. You can let this soak for a bit if your machine isn't very strong. Puree the pumpkin seeds and liquid into a smooth cream. Cut the tofu in slices and press out the nasty tasting excess liquid with a clean tea towel. Melt the coconut oil. Add the tofu and coconut oil to the pumpkin seed mixture in the blender and puree again, until everything is blended into a homogeneous mass. Test the cheese to see if the flavor is strong enough for your taste and add some more flavorings if you like. Take into account that the taste will mellow down a bit when the cheese has had time to cool down and firm up. Cover a cheese mold (like a bowl or other round container) with plastic wrap and pour the cheese mixture into it. Cover the mold with foil or a lid and put it in the fridge for at least 8 hours to firm up. If you are in a hurry, 2 to 3 hours in the freezer will also do the trick. In the fridge the cheese will keep for at least a weak. In the freezer it will last for several months. Put the pumpkin seeds in the jar of your foodprocessor or blender together with all the other ingredients except for the tofu (and the coconut oil which you will not use in this version). You can let this soak for a bit if your machine isn't very strong. Puree the pumpkin seeds and liquid into a smooth cream. Cut the tofu in slices and press out the nasty tasting excess liquid with a clean tea towel. Crumble the tofu with your hands use a fork to mash it into the pumpkin seed cream. Put the mixture in the fridge for a few hours so the flavors can meld. This cheese will keep in the fridge for at least five days. You can probably freeze it too, although the texture might change a bit. Sorry for the carby crackers in this picture! You can eat this cheese on a lowcarb crackers or as a dip for vegetables. Tofu garlic-herb cream cheese Vegan steamed rice cheese Silky chocolate mousse, low carb vegan Real cashew-based vegan brie! Glad you like it Anne! Thanks for your feedback. Dear Martine, I've seen your recipe for the steamed rice cheese and I am extremely excited! Finally a cheese which will firm up without algae which I can't have. Yaaaay. I have a question about this one though. Could you possibly recommend a substitute for tofu? I can't eat soy :(((( Or is there a way to transform the rice cheese to have a similar flavour to this one? maybe with pumpkin seed flour.. what are your thoughts? Thanks very much. 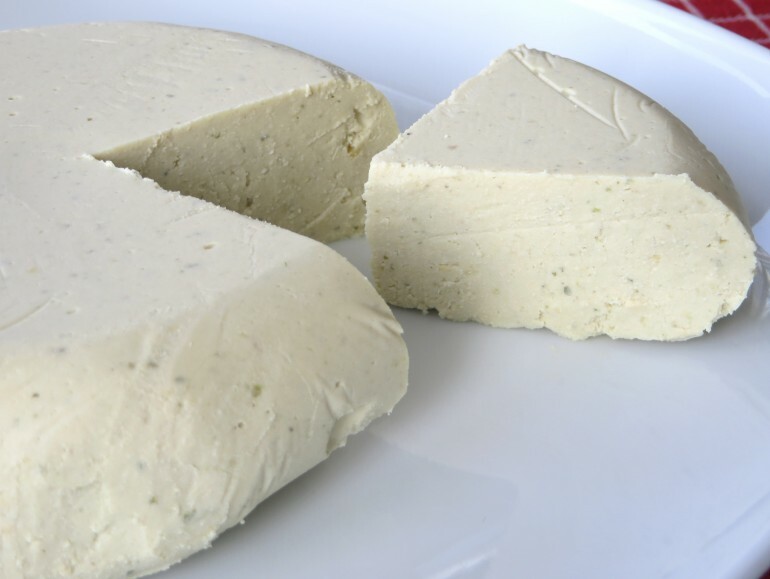 Keep up all the great vegan cheese recipes. Hi Eve, can you have cashews? You could sub the tofu with soaked raw cashews. Or you could use more sunflower and pumpkin seeds. The cheese might come out slightly more grainy if you make it entirely from seeds though. 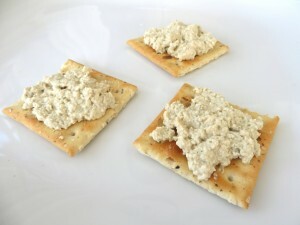 I loved blue cheese- but I dislike tahini and no longer have any. I can't understand how tahini could transform into anything that would taste like blue cheese! Olives have been my sub for blue cheese in salads, have you ever played with pureeing olives in a cheese? That is what I do for tofu feta- use the brine with a couple pureed. Hi Denise, this recipes tries to achieve the tanginess and special flavor of blue cheese, but without fermentation and mold cultures, that's basically impossible. Since posting this recipe, I've been experimenting with real cheese molds and the results are much better than anything you can achieve with tahini etc. I do like your suggestion for adding olives to vegan cheezes, I'll give it a try. I've made the Roquefort spores from a starter scrap & let it work on sour dough bread. Had success with that. Is that the same as the penicillium that you mention? The only thing is it is green of course so I don't think it would work on the camembert. I will have to try the rind. Hi Colleen, blue cheese mold culture (penicillium roqueforti) can indeed be grown at home on sour dough bread, but I would be very careful as wild mold cultures can be dangerous. I prefer to get my mold cultures from a commercial supplier so I know for sure they are safe. I do not know how to grow white mold for camembert (penicillium camemberti) at home, other than on cheese. Again I prefer to get it from a trusted supplier such as Cashewbert.